Welcome to another edition of This Week In Hot Takes. 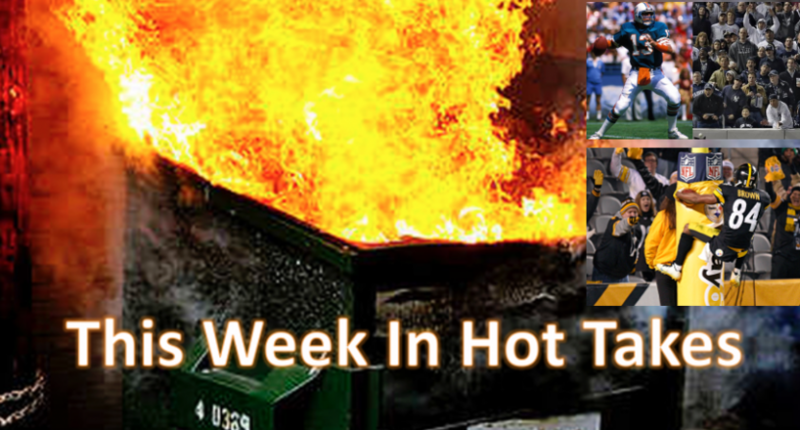 This time around, we’re looking at the hottest sports media takes from Sept. 28-Oct. 4. 5. Grant Paulsen has a whole lot of takes defending Tom Wilson: Washington Capitals’ forward Tom Wilson was in the news this week for a 20-game suspension (he’s appealing) after an illegal check to the head of St. Louis Blues’ forward Oskar Sundqvist Sunday. Part of the stated rationale for the length of Wilson’s suspension was “an unprecedented frequency of suspensions in the history of the Department of Player Safety,” as this was his fourth suspension in his past 105 games (including regular-season and playoff games). Most of that can be used as an argument, sure, and maybe Marchand is “dirtier” than Wilson, whatever that actually means. People can make that case on both sides. But it’s the lengths that Paulsen goes to that elevates this into a hot take, especially with the “You do not get a seat at the table. Adults are talking.” conclusion. There is, of course, room for rational criticism of the A’s decision or of Hendriks’ performance. This is not that. Marino only once threw for over 5,000 yards in a season (in 1984, which set a record that stood until Drew Brees broke it with 5,476 in 2011), and his best passing touchdown total (48) also came that year. He had four other seasons with over 4,000 passing yards, and one (1986) with 44 passing touchdowns; his third-best passing touchdown total was 30 in 1985. So for Kanell’s #facts to be true, Marino’s new career average would have to be about 20 percent better than the best numbers he ever posted, numbers he wasn’t particularly close to the rest of the time. Yes, if a young Marino was magically brought forward in time, he would probably be able to boost his passing numbers a bit given the passing focus today (there have been nine 5,000-yard passing seasons all-time in the NFL, and all but Marino’s 1984 have come in the last 11 years), but Kanell’s comments are a crazy level of hyperbole. The NFL records are 5,477 yards and 55 touchdowns (Peyton Manning in 2013), and while it’s maybe, maybe possible (if you think Marino’s better than Manning, Brady, Brees, etc) to argue that a young Marino in 2018 could break one or the other of those records (or maybe even both), it’s a stretch to suggest he could get to 6,000 or 60 touchdowns once given that no one has come particularly close. Much less put those numbers up every single year. Sorry, Danny, those aren’t #facts. 2. 98.5 The Sports Hub’s Mike Felger, “Big” Jim Murray and Tony Massarotti go off on “goombah” Yankee fans: It wouldn’t be a Yankees-Red Sox matchup without some takes, and boy, the guys from the 98.5 The Sports Hub afternoon show delivered those Thursday, blasting the Yankees’ fanbase with terms like “goombah” (slang often seen as derogatory towards Italian-Americans). Of course some trash talk of opposing fanbases is to be expected, but, uh, this seems to be going a little far. Maybe to be expected from the guys who thought it was funny to make plane crash noises when discussing Roy Halladay’s death, though. 1. Phil Mushnick says celebrations, ads and sports TV are responsible for the harassment of youth sports officials: What’s really delightful about New York Post curmudgeon Phil Mushnick is when he has at least part of a point, then veers completely away from it in favor of the things he regularly bashes. In this case, Mushnick has a column titled “Deranged adults scaring off refs and ruining youth sports,” and the first part of it actually makes sense; he discusses how there have been more and more cases of assault on or threats against youth officials in the last few decades, and how there also have been some notable declines in the ranks of those willing to officiate youth sports. But then it goes off the rails; instead of just putting the blame on the obvious culprit of athletes and parents who behave poorly, Mushnick goes for a whole “The devil made me do it” approach, saying that they’re led to that, and led to it by…all the things he normally hates, even if they’re really not connected. Sportsmanship — civility — within and around kids’ sports, they agreed, is in continuing, rapid decline. And the adult authorities who hold the most influence over sports — from the folks in the truck who select the replays, to marketing strategists, to see/speak-no-evil game announcers, to pros tweeting boasts and threats, to those who select the network promos for their uncivil content, to the sneaker companies, to cable TV’s faux-hip pandering show hosts, to Roger Goodell, who declared that rehearsed immodesty “is natural enthusiasm” that meets with his approval — keep fanning the flames. Look what they’ve done. Look what they continue to do. Why? Phil, we get it, you hate celebrations. And replays of celebrations, and promotions of celebrations, and discussions of celebrations, and rule changes to allow celebrations. And you hate the way games are promoted, and you hate shoe companies, and you hate anyone on TV who isn’t an ancient curmudgeon like yourself. But none of that seems particularly connected to the way that kids and adults behave towards officials in youth sports, and you’re sure not doing much to establish that link. Instead, you’re just going off on things you regularly complain about, and saying they’re the root of all unconnected evil. And that is a hot take.